Observation - Lesser stag beetle - UK and Ireland. Description: I saw this lesser stag beetle on the path outside my house heading towards the main road and almost certain death! Lucky for him I rescued him and put him somewhere more suitable. 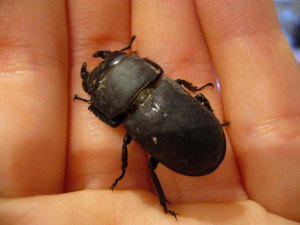 I saw this lesser stag beetle on the path outside my house heading towards the main road and almost certain death! Lucky for him I rescued him and put him somewhere more suitable.